I don’t tend to do well with new year’s resolutions. Case in point: I can’t remember what my resolution was for 2014. So my resolutions, the successful ones, anyways, are usually shifts in perspective. For that reason, for 2015, my plan is this: listen to new albums more than once before making an assessment as to whether or not I like them. You see, I have a bad habit of listening to an album once, thinking “hmm, that was pretty good” and just moving on, completely forgetting the album in less than 24 hours. I have a good reason for this (that there is just so much music that comes out that I don’t want to miss) but it really hinders my ability to create relationships with new music. Leonard Cohen released a new album in 2014 called Popular Problems that, I’ll admit, kind of came and went without much fanfare. (I wonder if part of the reason for this is its amateurishly ugly album cover). I listened to it once and thought, as previously mentioned, “hmm, that was pretty good” and just kind of moved on. Something inside of me, however, said “whoa. Slow down. This is Leonard Cohen we’re talking about! Give it another shot.” I did just that and I fell in love with much of this album. The lyrics are powerful and, although it doesn’t showcase the greatest musicality in the world, the tunes are all very enjoyable. It is a record that, on the strength of the lyrics, I know I will come back to again and again over the years, as I already have with his criminally underrated 2012 album, Old Ideas. I would not have developed this relationship had I not slowed down and let myself absorb this record. I’m letting 2015 be the year of the re-listen, even in records from 2015 that haven’t officially been released yet. I have acquired a copy of Animal Collective member Panda Bear’s Panda Bear Meets The Grim Reaper. I’ve liked his solo work in the past, but have never really listened to his records more than one or two times each. From what I understand, I’m doing myself a disservice. Many people see his Person Pitch as an essential record of the 00’s. So for this reason, I’ve been listening to his 2015 album almost exclusively while in my car. I’ve come to really appreciate it’s musical textures and nuances. The first time I listened, I thought “hmm, that was pretty good” but on each subsequent experience with the record, I’ve gotten into it more and more. So here’s looking to 2015: the year I slow it down. This week, we find ourselves in 2015. We’re talking about where 2015 is going to take us! It is the week of Christmas and Hannukah, so naturally, we’ve all got gifts on the mind! I will let you know about a few music-related albums and books that you can’t go wrong with. Admittedly, if you’re reading this now, you’re probably a little late to be buying something for a holiday gift. There’s always next year! Sufjan Stevens has released 10 Christmas albums and you can buy them all by picking up these two box sets. 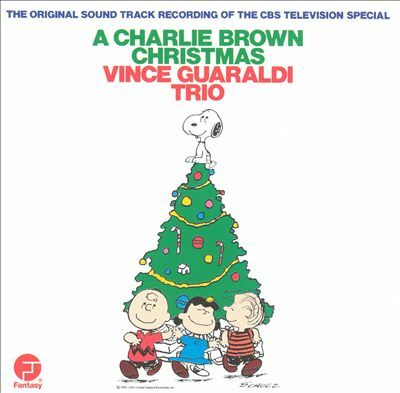 These are, in my opinion, essential, holiday records. The first box is mostly acoustic, thoughtful renditions of well-known tunes and originals whereas the second box set starts there but goes in a number of different, and frankly, weird directions. But there is, throughout, a true love of holiday music and that joy is evident throughout. Look, you know these tunes. This record is a stone cold classic and is a worthy addition to any record collection. If your idea of a great holiday is one spent alone with a cold one, watching a fireplace burn, this may be the music you’ve been searching for. This is one downcast vision of the holiday spirit. The first track is fairly upbeat and poppy but the lyrics tell a story about how lame Christmas music is. After that, the rest of the record takes on an extremely melancholy mood. 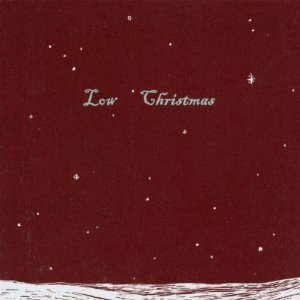 Its a great record, but it won’t resonate as holiday music for some. 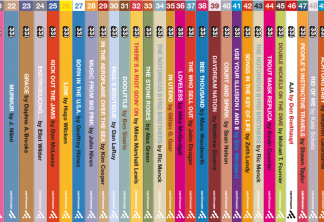 There’s a ton of music related books out there, but they are not all created equal. Here are a few great choices. You’ll need to know what the person you’re buying a gift for likes, but there’s an extremely high likelihood that an album by one of their favorite bands has been written about as part of the 33⅓ Series. Each novella-length book in this series takes its inspiration from a different element of the album it is based on. 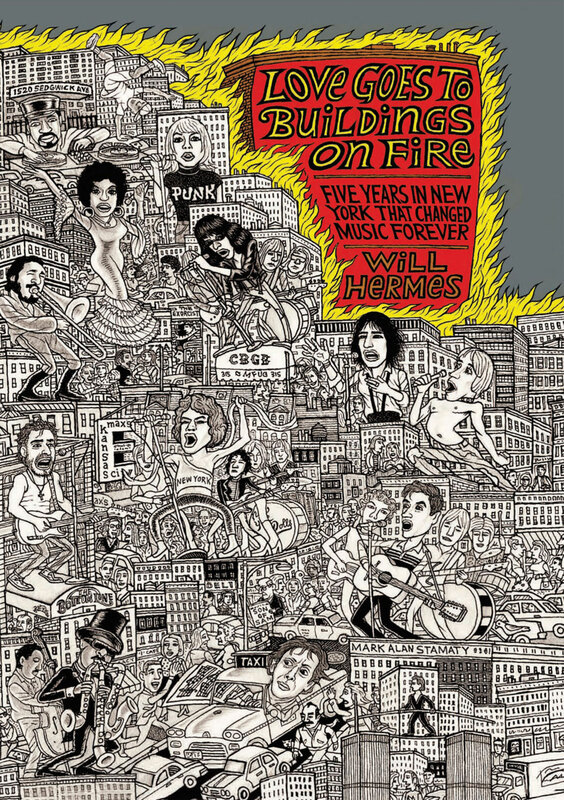 Some are short fiction while others are contextual accounts of how the album was recorded. You can’t go wrong with one of these. This. Book. This is the best book about music that I’ve read. It links all of the movements that were happening in New York City in the 1970’s (jazz, punk, hip-hop, salsa, disco, etc) to show how they were all related to and influenced each other. If the person you’re buying for has any interest in the history of American popular music, this is essential reading for them. 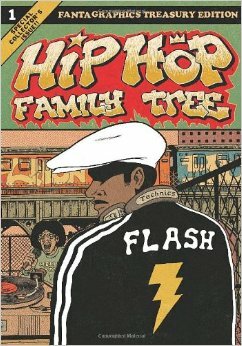 This graphic novel history of hip hop is huge in scope but personal in execution. It covers a TON of territory, telling the stories of so many players in the hip hop game that made it what it is, but stays grounded and never feels too heady. This series is HIGHLY recommended. It’s no secret that I love NPR podcasts. This blog, as we have mentioned several times, was inspired by NPR’s Pop Culture Happy Hour, and I’m also a devoted listener of Wait Wait Don’t Tell Me and This American Life. So I was pretty excited when Ira Glass started promoting a new spin-off podcast back in October. 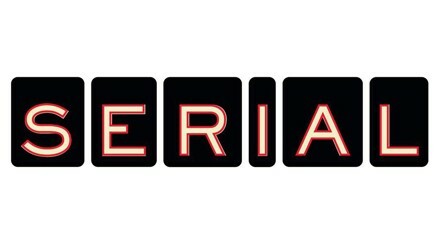 Serial is the first ever This American Life spin off, and the final episode of its first season was released this week. 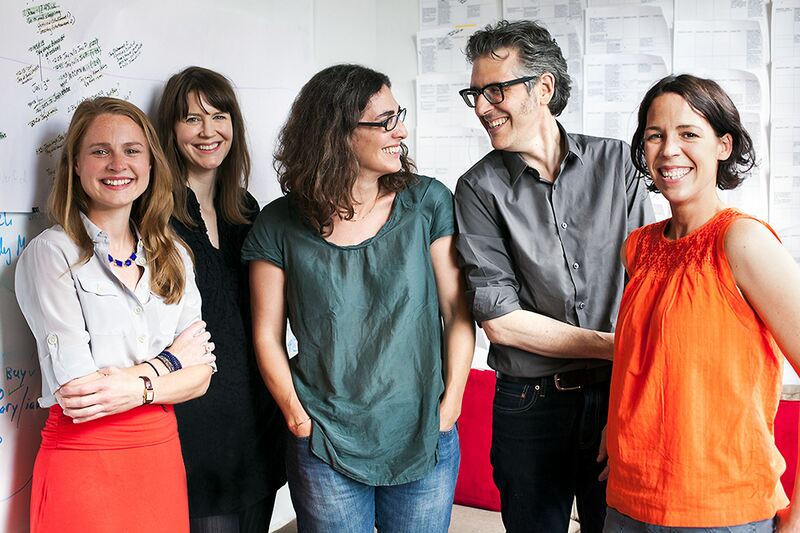 Serial is hosted by executive producer Sarah Koenig, who is also a staff producer on This American Life. Serial follows her year long investigation into a fifteen year old murder case. The season is one long story, focusing only on the murder of Hae Min Lee, a Maryland high school student who was murdered in January of 1999. Her ex-boyfriend, Adnan Syed, was convicted for her murder and has been in prison ever since. Koenig explores the doubts and holes in the case by tracking down witnesses and records, and by interviewing Adnan over the phone. The podcast is good in the same way that This American Life is good. It presents the story like a drama with rich characters, well-represented positions on both sides of an argument and clear facts. It feels honest and real, and getting to spend so much time in the world of one of those stories is wonderful. Almost every week while listening to This American Life, I wish that we could spend more time on at least one of the stories presented. So in one way, Serial is satisfying because it’s so in-depth that listeners are able to connect with the people in the story and take plenty of time to digest the information presented in each episode. Listeners feel like members of the jury, considering evidence and weighing each piece of the puzzle. I’ve heard criticism that Serial is essentially one long episode of This American Life, and that it’s over-hyped and overrated. I agree that it is probably what one long episode of This American Life would be like, but it’s a spin-off of that show, so I’m not sure why that’s a bad thing. I’ve also heard some arguments made about the ethics behind a show based on a real case, but Serial is not the first true crime show, and it won’t be the last. What sets the show apart, I believe, is that it presents a strong case for the need to reform criminal prosecution, and that it deeply explores what “reasonable doubt” actually means. People start to feel that someone is guilty as soon as they see that person behind the defense table in a courtroom. But if it’s your responsibility to decide whether to lock a 17 year old boy up for life, you’d better be pretty damn sure he deserves it. If there’s one thing I could criticize the show for, it’s not making an even stronger statement about what it means to go to trial and roll the dice with a jury versus taking a plea deal for a crime you didn’t commit. But the show isn’t speaking generally, it’s speaking to one specific case, and the case makes a strong statement on its own. Ultimately, the show is about doubt. Toward the end of the final episode, Koenig makes a strong distinction about having doubts as a person vs. having them as a juror, which was satisfying to me as a “moral of the story” wrap-up to the season. 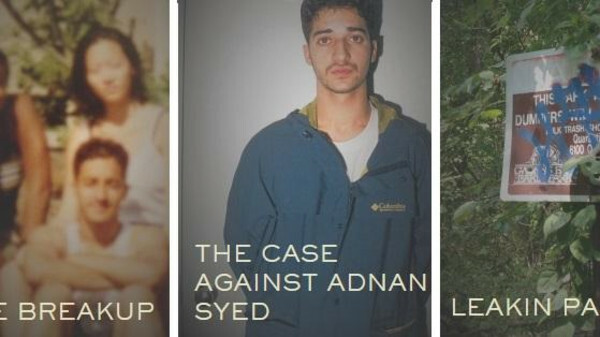 Adnan Syed’s case is moving through the appeals process, so I’m sure this isn’t the last we’ve heard of it. Regardless of that outcome, however, the podcast serves some interesting thoughts in a time when police action, criminal prosecution, and the justice system are all under more scrutiny than they ever have been before. 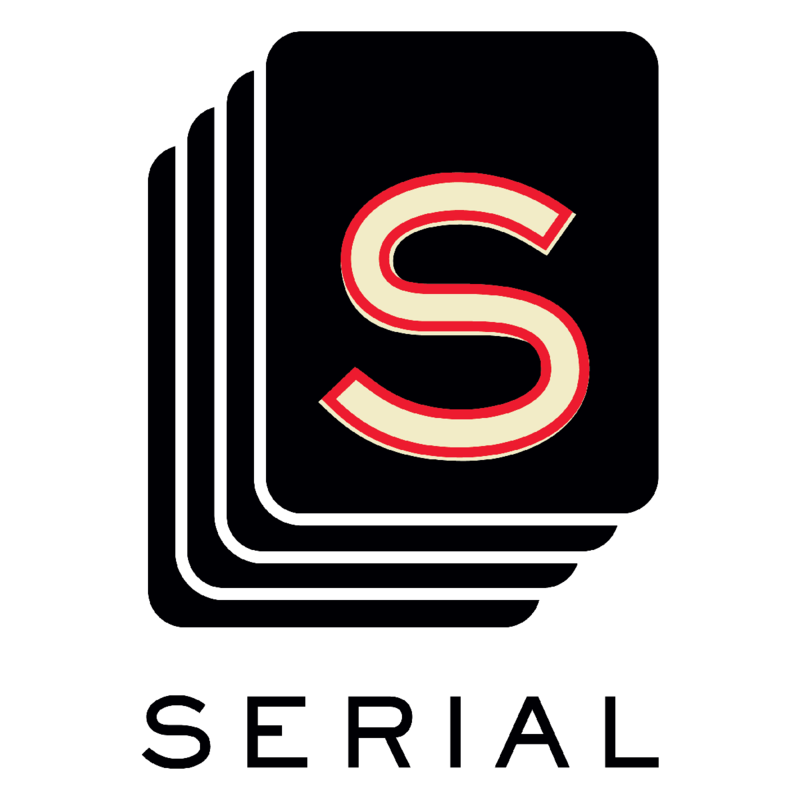 So join the discussion and check out Serial at serialpodcast.org. I really wasn’t sure what I was going to write about this week at first. All the books from last week that made me happy were series I already covered. Luckily I had a day that had me unable to write, but not unable to read. I quickly came up with three potential books to write about. And while the Venom Groot, Venom Rocket Raccoon, and the rhyming adventures of Captain Marvel and Lila Cheney are all really fun, they did not compare to the best new character of 2014. That’s right I’m finally getting around to talking about the amazing Ms. Marvel. 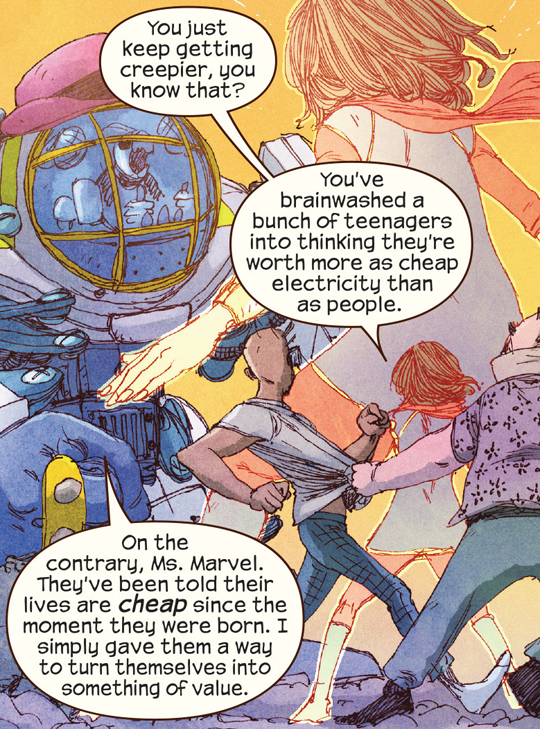 Every issue of Ms. Marvel is worth talking about, it’s a wonderfully charming series that feels like an instant classic. However I do want to highlight this week’s issue 10 in particular. 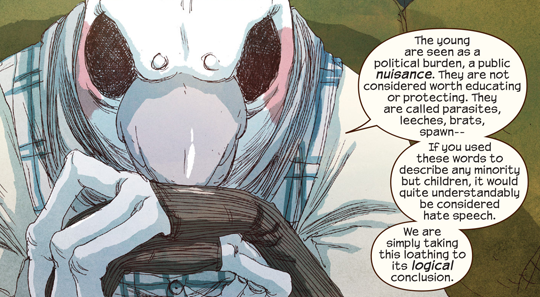 While it still retains a lot of its quirk and humor, this issue drops some heavy social commentary. Author G. Willow Wilson holds no punches as she unloads some truths about the misconceptions of millennials as well as the general attitude of anger towards teens. It’s just amazing how much she is able to say without making it feel forced, and without stopping the flow of a major turning point in the climax of the book’s first year of stories. It’s really impressive, and a sign of why Wilson is a much raved about writer. Since it’s still new I don’t want to say too much for fear of spoiling, but this issue does deserve a lot of credit for how well done it is. 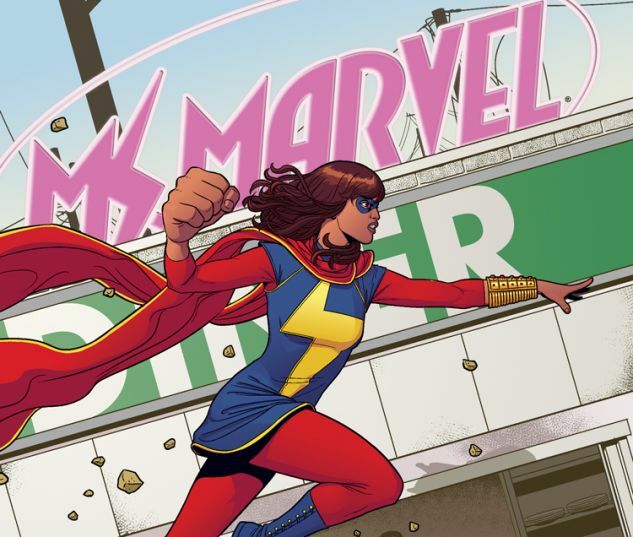 Last week I named Kamala Khan, the new Ms. Marvel, the best new character of 2014, but didn’t get much chance to go into real detail beyond her importance as an inclusive figure. She isn’t just a Muslim by name, but her religion and life style are on full display in the book. No doubt due to Wilson’s own Muslim faith. However it’s the little details of characters that make her so charming. Things like being an Avengers fan fic writer, or using terms like embiggen and disembiggen to activate her powers early on. Add to that all the realizations she has about the nature of heroism and all the diversity that makes her so important is only half of why she is so enjoyable to read. I hope she manages to stick around for a long time, and luckily she seems to be a constant fan and critic favorite. The art is usually handled by Adrian Alphona, you might remember me talking about him when I did my Runaways recommendation. The same things still apply. 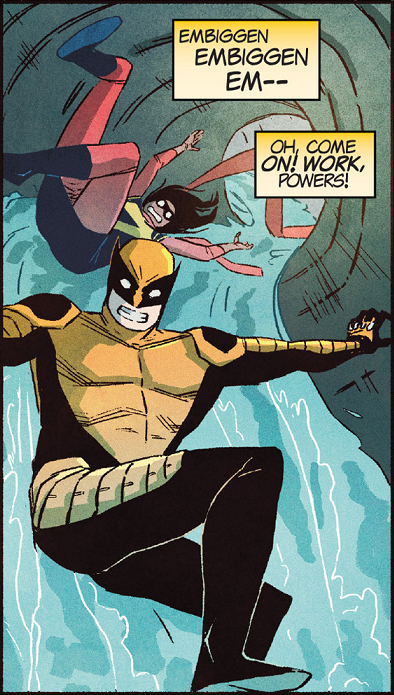 Special mention should be made of how well his style compliments the elastic styled powers of our heroine. Even when her fist is bigger that her body it works and looks natural. Alphona also does a wonderful job capturing teen body styles, from thin a gangly to more buff forms. This is so rare with teen heroes that it’s just great to see when someone gets it right. Colorist Ian Herring uses a palate that evokes a coloring book feel. Not in a bad way. It reinforces the youthful feel of the series. It also helps the art achieve a purposefully rough around the edges look befitting a hero who still doesn’t fully understand her powers. The art is fun and playful, without losing much seriousness, and is just another reason to come to this book. 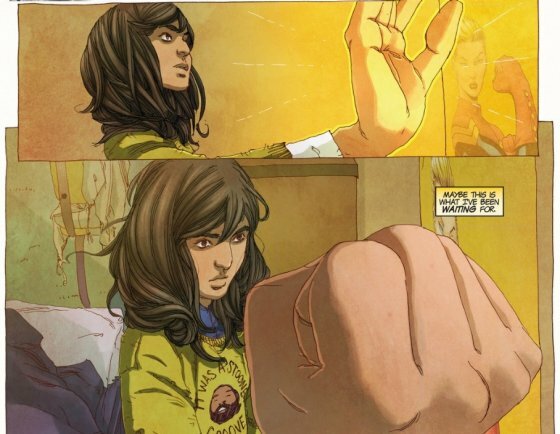 I love Kamala, and Ms. Marvel. The warm and over whelming positive response is so amazing to see, this is a character that matters to people. She means something, and her story is so worth hearing. The first trade should be out, and maybe even the second. It’s the cheapest book Marvel’s putting out right now at $2.99 an issue, so do yourself a favor pick it up. This album was apparently released a couple of years ago to absolutely no fanfare, but was remastered and reissued this year. And look, I’m not saying this album is groundbreaking or anything. It is fairly standard in its adherence to the rules of singer-songwriter music. But it is delightful and warm and exactly what I was looking for in a guy-and-his-guitar album. Check out the song Dark Side of the Moon and you’ll see what I mean. I will probably forget about this record in a couple of months (I don’t mean that negatively either, it feels like an “of the moment” record), but for now, I’m really enjoying it. And I think you will too. I’d heard about Luluc from a number of different sources throughout 2014. They really resonated with people this year. The snippets of songs I heard never made me say “man I need to listen to this,” but I figured now is the time! I get the hype. It isn’t a record that necessarily clicked on first listen. It took me a couple of plays, but I can attest… this record is the real deal. It is beautiful and timeless, like a great Nick Drake record. Perhaps I needed to hear it in the right time of year, too. This is the perfect winter album.